Should You Contact The Miami Dade Beekeepers Association For Bee Removals? If you live in or around the Miami-Dade area and find bees on your property, you likely want them removed. Likewise, if you run a farm or any kind of gardening or agricultural facility in the area, then you might want bees on your property so that flowers and crops can get pollinated. In either case, you might wonder if contacting the Miami Dade Beekeepers Association is worth it. This can be especially true for bee removal if you’re urgently seeking an industry professional to come handle the matter. The truth is actually a bit of a mixed bag though, as the Miami Dade Beekeepers Association doesn’t actually directly handle bee removal or even bringing hives out for pollination purposes. However, you can use their website to contact individual participants and members that might provide such services. Contacting individual members can be done on a county by county basis, as the association belongs to the larger Florida Backyard Beekeepers Association. It tracks its members by the community they live or operate in. Something good to keep in mind when looking at this list is that membership in the association doesn’t necessarily indicate skill set, abilities, prices, or experience. It’s up to you as a consumer to do your due diligence, contacting them for a consultation and then doing background checks on them if you feel it is warranted. Association membership usually just indicates proof of insurance and Florida Beekeepers Registration and that both were current at the time of listing. There is also a Facebook group that goes by the name of the Miami-Dade Beekeepers Association, and it says it’s available for removals among its members. However, at the time of writing, it does not seem to have a published member directory, website, or phone number. Also at the time of writing, there were no Miami-Dade specific members of the Florida Backyard Beekeepers Association page for that city and county listed. That should serve as a word of warning, because if you consult a beekeeper or removalist on your own, and they cite association membership as part of their industry credentials, something would seem to be amiss. Checking for someone from a neighboring county that includes Miami in their service area is a smart move. Getting an industry professional for your bee removal needs is good to do, since they can do so safely without you or them getting hurt. They can also likely save the hive, which is precious to do, unless you are determined it just be destroyed rather than relocated. The national bee population has been decimated in recent decades, and scientists are not entirely sure why. The heavy use of pesticides, both on an industrial scale and in local consumer use, is suspected to be a culprit, although landscaping that deliberately avoids bee-friendly plants might also have something to do with it. Attempts at rebounding the population have been somewhat successful, with beekeepers or removalists saving hives and relocating them when possible, and many departments of transportation or even schools creating safe areas for bees with the specific flowers they plant. There are many insects and animals which are labeled pests and many people use chemical solutions to get rid of them. However, these chemicals are not only harmful to the pests, but also to the environment. There are a number of chemical free pest control options that you can consider instead which are better for the environment and the eco-system. All pests will be the prey of another animal and you need to consider this when looking at pest control. Encouraging natural predators to a pest infested area will naturally control the problem. The predator that you encourage will vary depending on the pest that you have. Garden pests can be controlled through the introduction of birds, hedgehogs, ladybirds and lacewings. If you do not want to harm the pests and you have the time hand picking is an option. This is a very time-consuming method of pest control and not generally recommended for most people. However, if you have a small area where the infestation is located this could be an option. If you have pests attacking your plants then you should consider spraying them with water. This will work well for aphids and similar pests which infest your plants. Some people choose to combine a light soap solution with the water, but this could be harmful to the plants and will introduce unnecessary chemicals to the environment. There are many organic-based solutions that you can consider for pest control including plant oils and fruits. These deterrents are completely natural and will not have a negative impact on the environment. Certain pests are repelled by mint while others will be repelled by lavender. It is important that you determine what pest you have and how you can deter them. Pests can be controlled through the use of biological entities such as parasites. These parasites will latch onto the pest and generally eradicate them. However, you will have to be careful with these biological controls because you do not want to target any of the beneficial insects in your home or garden. One of the biological controls you can consider is the parasitic wasp Encarsia which targets Whiteflies. Using plants to protect plants from pests is not something that everyone considers. However, it is possible to have plants which attract predators next to plants that are vulnerable to pests. Planting the vulnerable plants between the other plants will also help to disguise them and make it harder for the pests to find the plants they want. If you want to prevent pests getting to your plants you should consider barriers. Different barriers will work better for certain types of pests such as copper piping will deter slugs from coming to your plants. Placing sharp objects such as eggshells around your plants can deter a lot of different pests. There are a number of barriers that you can use including straw and plastic bottles. If you have an infestation of termites you will need to consider the termite control options available. There are 4 common termite control methods that you should consider which are non-chemical solutions, chemical solutions, barrier solutions and termite baits. The method that you choose should be one you are comfortable with and that will rid your home of termites. A lot of people are not comfortable with the use of chemicals in their homes and they should turn to non-chemical termite solutions. One of these solutions would be to have a physical barrier erected during the construction of the house. This barrier will prevent the termite infestation from starting. Another non-chemical solution is to use biological control agents. These agents include fungus and nematodes which attack the termites and kill them. There has been success in laboratory studies when using biological agents, but the use is not regulated by the FDA and could be difficult to apply. There are a number of EPA approved chemical solutions that can be used on termites. The EPA has tested these pesticides and concluded that they are safe to use. The chemical solutions that can be used to control termite infestations are called termiticides and you will need to purchase these for use in your home. The approved treatments using chemicals include liquid soil-applied termiticides and termite baits. You can also purchase building materials which have termiticides within their structure. There are also special wood treatments that you should consider. One of the most commonly used termite solutions is a soil-applied barrier treatment. This treatment will have termiticides applied to the soil around the home and act as a barrier stopping the termites from getting to the house. It is important that these treatments are conducted properly and by a professional. If the barrier treatment is not completed correctly it can cause a contamination of the house and the drinking water should it be drawn from a well. The treatment will also be ineffective against termites if not done correctly. The professional you hire to complete this task should be licensed and trained in the use of the pesticides. Over the years, several bait systems have been created to help control insect infestations and limit their effect on human life. The bait systems will use cellulose bait which contains a slow-acting insecticide. The active ingredients in the bait will target different parts of the termite to control and exterminate. One ingredient in the bait will inhibit the development of insects while another will disrupt the activity of the termites. It is important that you choose a bait system that is designed to target termites. General insect bait systems might not have the ingredients necessary for controlling termites. Are Pesticides Safe To Use? As many of the common control methods are chemical based you need to consider whether or not they are safe to use. In the United States, the EPA ensures that all pesticides are correctly labeled with directions and meet safety standards to protect both human life and the environment. While these solutions are toxic, if handled correctly they should not cause harm. It could be said that there are two types of people in the world: those who love snakes and those who seriously dislike them. Yet, no matter which of those groups you fall into, you probably don’t like the idea of running into a random snake in the wild that you can’t identify. On one hand, it could be completely harmless. On the other hand, it could be extremely deadly. A big part of overcoming a fear or dislike of snakes is to understand more about them. The more you know, the less mysterious and dangerous they seem. One of the first steps towards understanding them is learning how to identify snakes. There are quite a few different breeds of snake spread throughout the world. Learning how to identify each and every snake would take more than a lifetime. However, you can learn to identify some of the major families, such as certain vipers, as well as some of the most common snakes you might see in a residential area. Identifying a snake is not necessarily about determining whether a snake you encounter is poisonous or non-poisonous based on certain characteristics. There aren’t many characteristics that will give away this detail. Instead, you learn to identify the particular snake itself based on body shape and possibly color. Then, perhaps, you can identify if that type of snake is or is not poisonous. There are a few steps to keep in mind when learning how to identify snakes. They are rather basic, but they will help you get a better grasp on identifying a particular snake. This is similar to the system that many experts use. A snake can be classified into one of three body length categories. These categories are large, medium, and small. In addition to the length of the body, the width should be considered as well. This system works best if actual measurements are obtained, but of course, you should never attempt to measure a snake you find in the wild if you are not trained to do so. Next is the shape of the head. This can be difficult to identify because some snakes may alter their head shape when in an aggressive state. If you can examine the snake from a distance and are certain it is not acting aggressively, then you will get better results. Vipers are known for their flat, triangular head shape. Other classifications include oval, round, and long. Finally, try to identify characteristics about the eyes. This includes the shape of the pupil, the color of the eye, the size of the eye, and its shape on the face. The more information you can record on the subject, the better. It’s a good idea to keep a book that contains the many different snake families on hand. You can then record the details above in a notebook and use the information to identify the snake. Of course, in this day and age, you could also use your smartphone if you are in a location with a signal. Although bees are an essential part of our agricultural system, that does not necessarily mean that you want them hanging around and buzzing close to you and your loved ones. If you are wondering how to exterminate bees, you have come to the right spot. When asking yourself how to exterminate bees, it is important to realize that there are various options to do so, for example carpenter bee traps. What this option does is trick bees into entering via a small hole found in a piece of wood. Upon entry the bee falls into a plastic bottle that is empty. This method however is not effective for bee control; it will not actually treat the source of a bee infestation. Yes some bees will be trapped, but you will still be left with an infestation on your hands. Another point is that being as bees are beneficial pollinators, instead of killing them, they should be relocated so this is not a method that entomologists, pest management professionals or beekeepers recommend. Covering a bee hive with a plastic tarp allowing the sun to heat the hive to a temperature that the bees will not be able to survive or vacuuming the hive out are also other methods of bee removal. These however are also not the most effective and in the end could most likely result in hordes of angry bees that will try to sting you so they are also dangerous options. When all’s said and done, the best solution when wondering how to exterminate bees is to call a pest management control professional or a beekeeper. 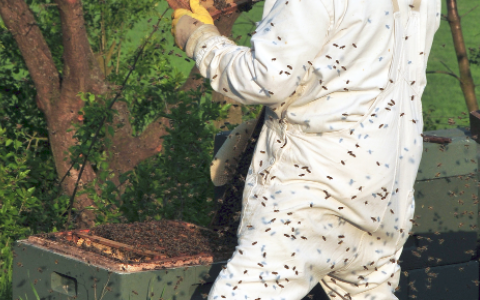 They are well versed in the methods that will work for the specific type of bee you are dealing with and will have the proper protective gear to safely get the job done. It is important the exit hole to the bee colony never be sealed. Much like wasps, bees will look for another exit; this could mean your home. If it is a hive that contains honey, it has to be removed by a professional. If a professional does not remove the hive prior to the wax decaying, this could result in not only a honey-waxy mess but even worse, structural damage. It could also attract other insects that once the bees are gone, will come around to feast on the honey. It is important the children, pets or other people in general not be around as you attempt to handle a bee problem and you should always wear a proper protective gear. There are sources who say that on cloudy or windy days, bees tend to be more aggressive as in these conditions, they are unable to hunt for food. Keep in mind however that in any sort of weather condition, bees do tend to be short tempered so it is important to always approach with caution. Once again, the best way to really get rid of a bee problem is to have a professional asses and handle the situation and avoid attempting to do so yourself. A world without pests would be nice, but that is just a far-fetched ambition because there are more pests in the world that there are humans. As such, the fight against ants and other pests is an ongoing war that man can never win. However, exercising efficient ant control measures can help you regain control of your ant infested home. The measures are a mix of having knowledge about the life of ants, taking precautionary measures, and using eco-friendly eradication methods. Knowing your foe is the only way to better your chances of winning a battle. As such, effective ant control calls for understanding the life of the ants. Every ant species has a unique way of life, and this determines how the ants can be eradicated. First, if you find an ant roaming in your house, then expect there to be a colony nearby. Ants live in colonies, and a colony is run by an ant queen whose primary function is laying thousands of eggs to grow the colony and have a workforce that expands her kingdom. The insects might have established a colony outside your home or found a suitable place inside your home to establish a colony. They only come out to find food thus ants can be found in even the cleanest of places just as long as there is food. These insects eat a variety of food; however, they have a sweet tooth for sugary foods. Sometimes things might not be as bad as you may think when you see several ants in your home. It might be what you saw were scout ants sent to locate food. As such, the first step to take so that you can regain control of your home is to get rid of all food sources. It is a preventive measure that requires you to clean up your home and its surroundings. A dirty place will be a haven for pests, so practicing proper sanitation techniques is an important element in ant control. Keep your kitchen surfaces and appliances clean making sure no food crumbs are left lying around. Stores all foods in tightly-sealed containers. The harder you make it for the insects to find food, the more likely it is for them to go looking for what they seek elsewhere. Complement your sanitary efforts with professional pest management services. The pest control experts will develop an ant eradication plan based on your infestations scenario that will also include measures that prevent any re-infestations in future. The pest management plan might include finding any existing ant colony and ways of destroying the entire colony. The colony can be destroyed using different methods such as flushing chemicals into the nest and fumigation. The goal is to ensure the queen is killed or the nest is completely inhabitable forcing the queen and her subjects to migrate to another place. In closing, effective ant control is a matter that requires a consistent commitment to sanitary techniques that act as preventive measures and the ant eradication treatments delivered by pest control experts.